Could late-night chitchat be hazardous to your teenager's health? The fact that teenagers are overly attached to their cell phones is nothing new. For that matter, neither is their habit of gabbing on them late into the night. (I remember lying in bed gossiping for hours with my BFF—on a land line of course, since my teen years predated the era when everyone over the age of 10 has a cell phone.) But a new study is the first to link this seemingly innocent teen behavior to some pretty serious side effects. Japanese researchers analyzed data from nearly 18,000 teenagers (in grades seven through 12), and found that there were “significant associations” between cellphone use after lights-out and poor mental health, including suicidal feelings and an inclination toward self-injury. Only in the younger group (seventh through ninth graders) did late night cellphone use also cut into sleep time. 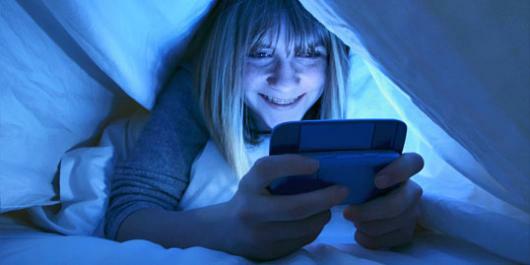 Apparently, older teens stay up late regardless of whether or not they’re on the phone. And that could very well be part of the problem. Previous research has found a connection between lack of sleep and mental health, in particular, suicidal thoughts. But this whole topic is a bit of a chicken-vs.-egg conundrum: Depression can cause sleep troubles, sleep troubles can cause depression. So it’s hard to pinpoint exactly what’s to blame. Add to that the fact that using cellphones and other electronic devices (tablets, laptops, even television) has been linked to insomnia. Melatonin is a hormone secreted by the body that helps signal that it’s time to sleep. But the blue light emitted by these gadgets reduces the levels of melatonin the body produces. And that can lead to some sleepless nights. I may be long past my teens, but I know that bedtime emailing and Facebook updating doesn’t exactly lull me to sleep. Of course, this study should be read with caution. The subjects were all Japanese teenagers, so you can’t necessarily assume the same results would apply to American kids, given the cultural differences between our countries. And while the data implies a connection between late night cellphone chat and mental health problems, the researchers emphasize that the cause of the connection is unclear. The takeaway for parents and teens? Staying up too late—whether you’re talking on the phone or IM-ing on your laptop—can be hazardous to your health.